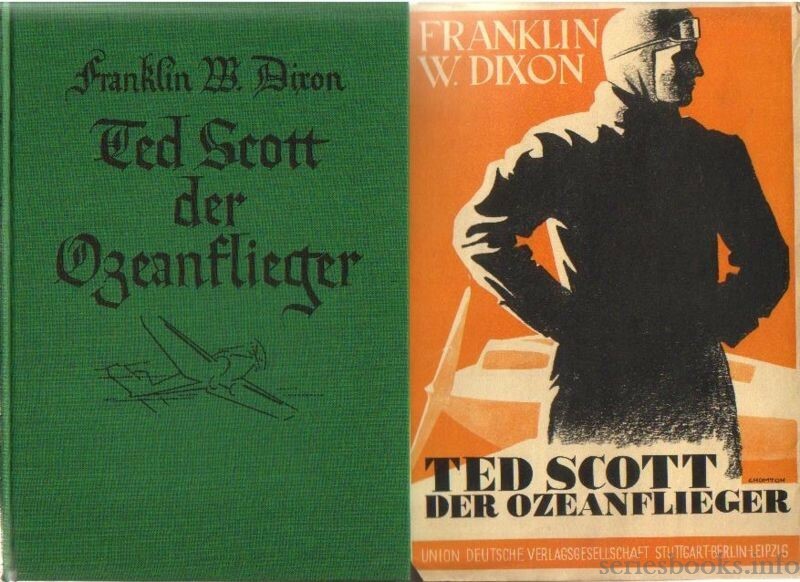 “You'll like Ted Scott. 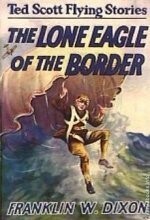 He's a daring young American whose feats of flying thrill the whole world, but he keeps a level head on his shoulders. 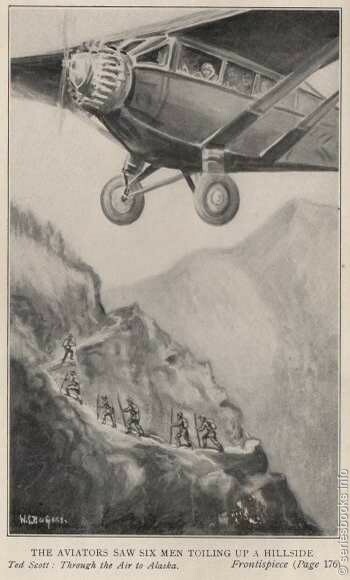 The whole flying series has been inspired by recent aerial exploits and is dedicated to Lindbergh, Commander Byrd, Clarence Chamberlin and other heroes of the skies.” - 1930s Grosset & Dunlap advertisement. 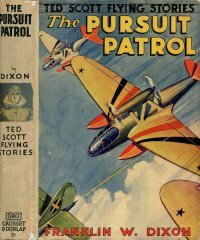 Ted Scott is a product of the Stratemeyer Syndicate, published by Grosset & Dunlap from 1927 to 1943. 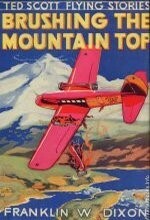 There are two binding styles: red (1927-1932, volumes 1-15) and tan (1932-1943, all volumes). 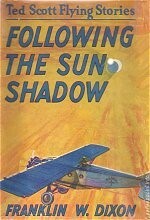 Volume 15, "Following The Sun Shadow", in the red binding is a rare edition having gone thru only one printing when the change to tan binding occured in 1932, similar to the rare Hardy Boys red binding edition of "While The Clock Ticked" and the tan quad binding of "Tom Swift and His Giant Magnet". 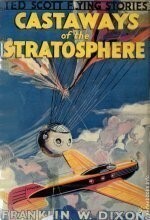 All editions have a unique full color dustjacket on coated paper and glossy frontispiece, except vols. 19 & 20 in which the frontispieces are printed on plain paper. 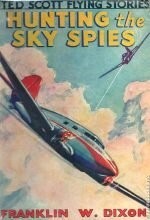 The pseudonym Franklin W. Dixon was also used for the Hardy Boys stories. 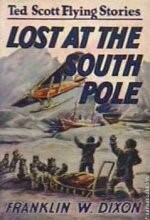 For the first several years of publication, the Ted Scott series outsold the Hardy Boys by a wide margin. 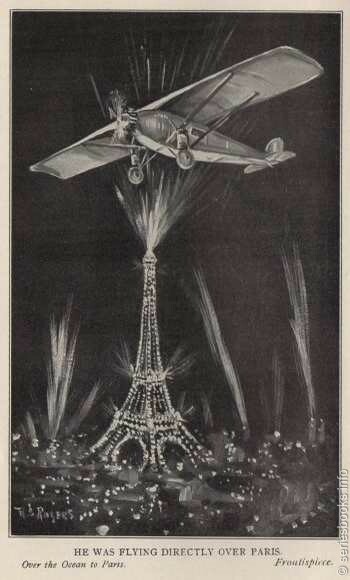 "In which we meet Ted Scott, daring young American, who flies alone from New York to Paris." 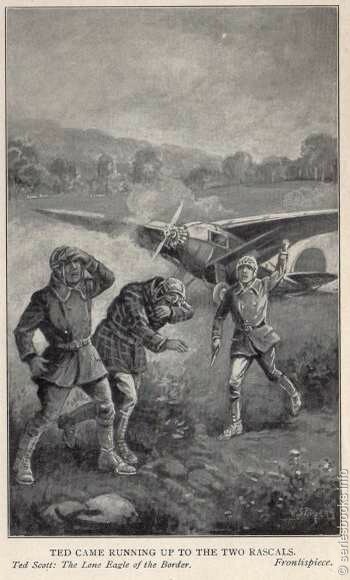 "After his return from Paris, Ted tours the country in his plane, and rescues his chums from a blazing machine a mile in the air." 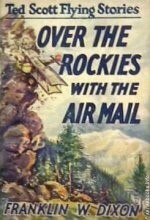 "In this volume Ted Scott goes back to his 'first love,' The Air Mail Service and is lost in the wilderness of the Rockies through the treachery of his enemies." 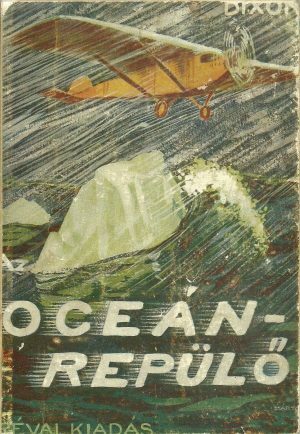 "After breaking the world's altitude record, Ted sets out to conquer the Pacific and in a thrilling attempt flies from San Francisco to Honolulu." 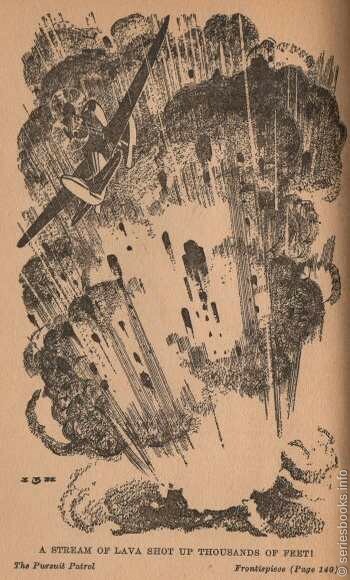 "Two of Ted's best friends disappear while flying near Porto Rico. 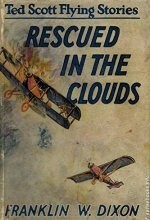 After a series of exciting adventures the young air ace rescues them in the nick of time." "I sure would like to make that record breaking flight and win that prize money" stated Ted Scott, hero to untold millions. "Please let me write you a check to finance your new plane" responded Ted's loyal friend, rich young businessman, Walter Hapworth. "Oh but you must let me pay half" protested Paul Monet, a rich Frenchman whose life Ted had once saved. "Oh Ted, I just know something terrible will happen" blubbered Ted's aged, care-worn foster mother, Charity Browning. "Don't worry Ma, I guess the Lord is the Lord of the air as well as the ground" consoled her husband, the ever credulous Eben Browning. "Well, now that that's settled, I must go down to the Devally-Hipson Aero Corporation and see how things are going" stated Ted as he left the formerly run down but now refurbished Bromville House. 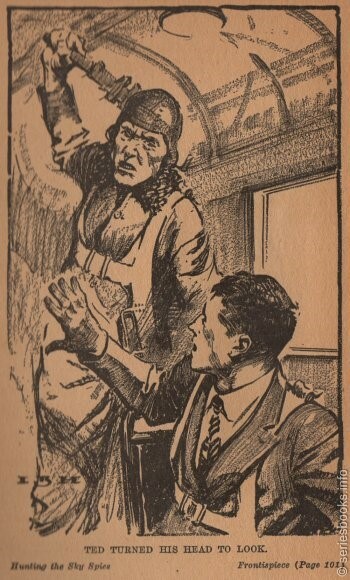 Passing the luxurious Hotel Excelsior, owned by Brewster Gale, swindler, thief and general all-around rat, Ted encountered the dissipated, coarse featured, red headed, bucktoothed, gaudily attired sons of the aforementioned Brewster Gale, Gregory and Duckworth, Greg and Duck for short. "Here we are to taunt and insult you and catch another beating" sneered the twins. Quick as a wink, the flailing fists of Ted Scott caused both twins to measure their length in the grass. "We'll be back!" muttered the twins, shaking their fists as they slunk away. 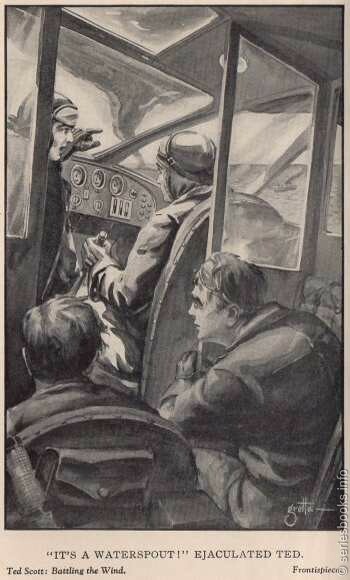 Arriving at the airfield, Ted recounted his adventure to his particular chums, Big Bill Ellison, Tom Maltby, Mark Lawson, Breck Lewis, Jack Forest and Joe Scarlet. "You sure taught them dogs a lesson! You're all wool and a yard wide and a brick too!" they all vouchsafed. "Well, I guess I better take off now" stated Ted modestly. His friends gasped in fear as the heavily laden plane just barely cleared the wires at the end of the runway. As Ted sailed along happily reflecting that he was now in his natural element, he felt growing pangs of hunger and thirst. "I guess I'd better have some of those sandwiches and coffee now" he thought to himself. Shortly thereafter, Ted passed out due to the drugs with which his enemies laced the sandwiches and coffee. 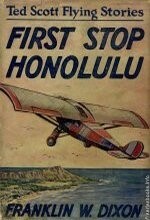 In addition, a howling hurricane had suddenly spring up, tossing the little plane about like a chip on the ocean. 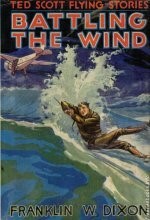 Still Ted dozed on in a stupor as the gallant little plane sank closer and closer toward the angry ocean's tossing whitecaps. Suddenly a bolt of lightning hit the plane, arousing Ted from his slumber. He looked out the window and saw scarlet ribbons of flame creeping along the edges of both wings! 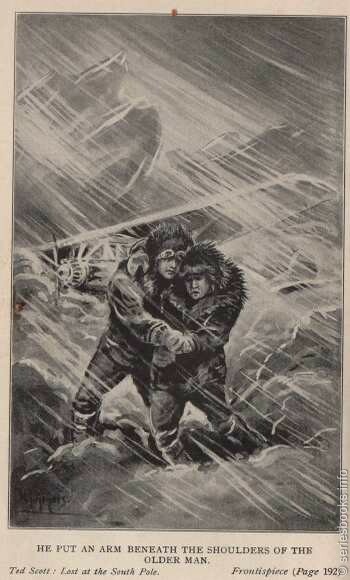 "Steady boy, this is no time to panic" thought Ted. 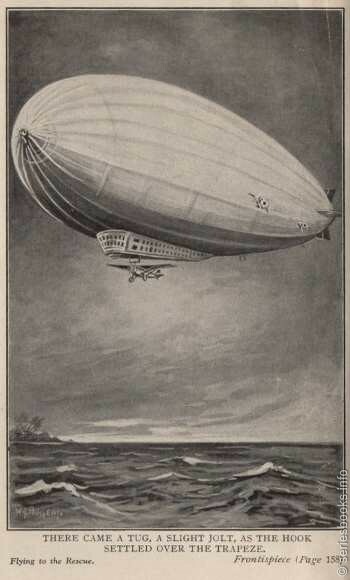 In an example of the now famous "Ted Scott Luck", he guided the plane toward a gigantic waterspout which suddenly appeared before him. 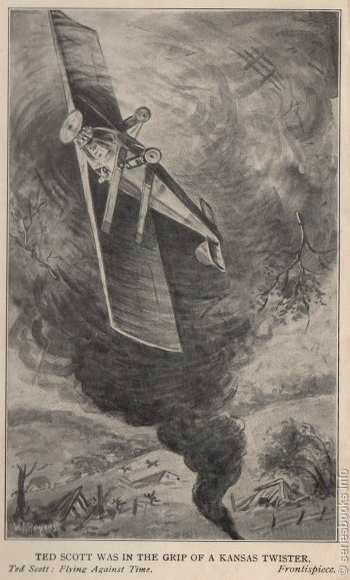 Torrents of water quickly extinguished the creeping flames and the updraft of the enormous waterspout quickly pulled the gallant little plane toward the heavens and away from the dangerous ocean. "Lucky that waterspout came along when it did, I'll tell the world!" murmured Ted. The skies cleared and Ted sailed along through the starry skies. 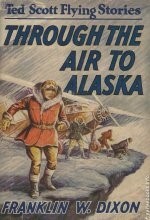 Suddenly, Ted felt and heard a series of thumps as if a giant was outside the plane banging on it. "That's no giant, it's the biggest flock of seagulls I've ever seen" exclaimed Ted. 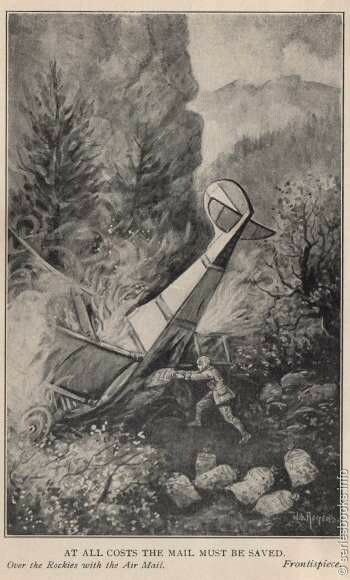 There was no avoiding the flock of maddened birds, soon the engine of the gallant little plane began to falter. "I guess I'd better bail out!" thought Ted. He hoped Charity was praying for him now. Ted flung open the door and stepped off into space. 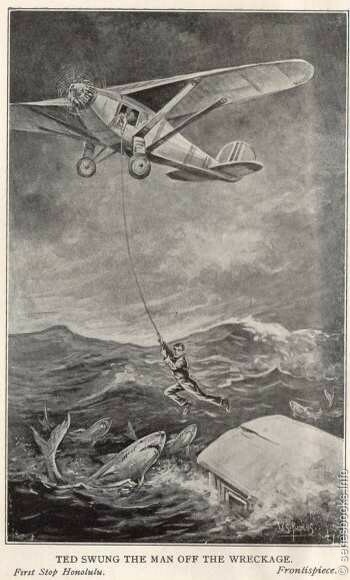 He quickly pulled the ripcord of his parachute but nothing happened! He would be smashed to bits! Suddenly the parachute opened wide and Ted found himself floating gently down. 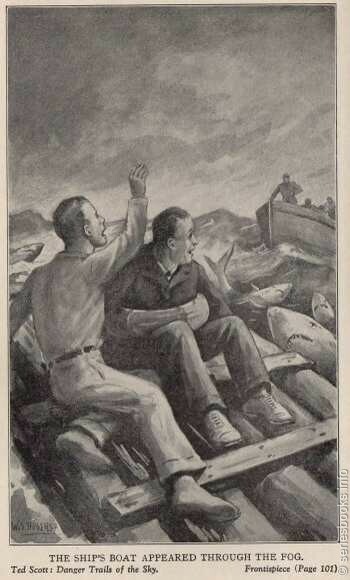 "I guess I'm OK now" he thought, "No, wait a minute, I'm still over the ocean! I could be drowned! Wait! What's that sound?" 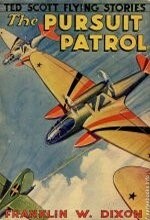 Ted looked below him and saw his gallant little plane, now running perfectly and on an even keel. 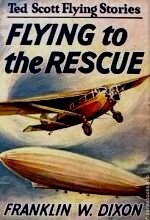 "If I can only guide myself so as to land on my plane, I'll be saved!" thought he. 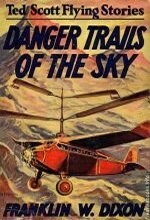 Every muscle in his sinewy body was strained to the breaking point as he guided himself toward his plane. Would he be able to thread the needle? 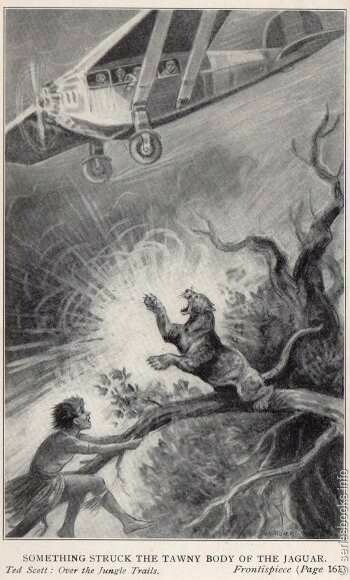 With a final super-human effort, Ted landed upon the onrushing plane and quickly clambered inside. He was safe! He knew Charity must have been praying for him. "I sure could use some more coffee" thought Ted, "I have to fly over the ocean to Paris, rescue flood victims, fly airmail over the Rockies, break the altitude record, fly to Honolulu, rescue missing flyers in the West Indies, fly south of the Rio Grande, fly to Australia with a stowaway madman on board, be the lone eagle of the border, look for smugglers, break the coast to coast speed record, fly over the jungle, fly to the South Pole, fly to Alaska, fly up the side of Mount Everest, outrace an eclipse, fly around Cape Horn, brush a mountain top, rescue explorers in the stratosphere, hunt spies and pursue enemy platinum pirates in the next World War! And in that order too! It's going to be a busy week!" 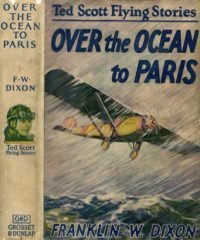 My Review Of "Over The Ocean To Paris"
COMMENTS: The Ted Scott series was written to cash in on the aviation craze that swept the nation after "Lucky Lindy" made his famous flight. 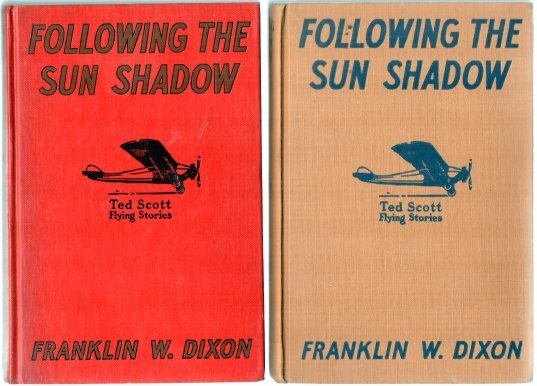 This story is so close to recounting that flight and Ted Scott so closely resembles Charles Lindbergh, it's a wonder Lindy didn't sue for royalties! The Syndicate must have had it's ghosts working overtime on this volume, since it hit the stands not long after Lindy landed in Paris! 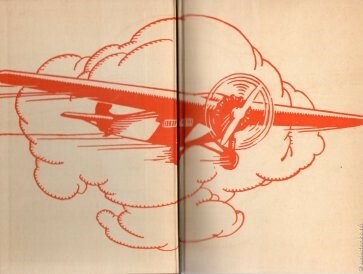 Aviation stories had become a staple for "Boys" series' starting not long after Wilbur & Orville made the first flight, however, there were several other aviation series started around this time (Andy Lane, Slim Tyler, Randy Starr among others) but, for my money, the Ted Scott series is superior to them all. This story is well written (surprisingly so, considering the fact that it was rushed into print). 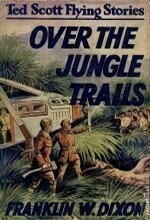 It carries the reader along with the right blend of action, adventure and a bit of mystery. I don't know if kids back then were smarter but the prose is certainly superior to that which is written to the same age group today. 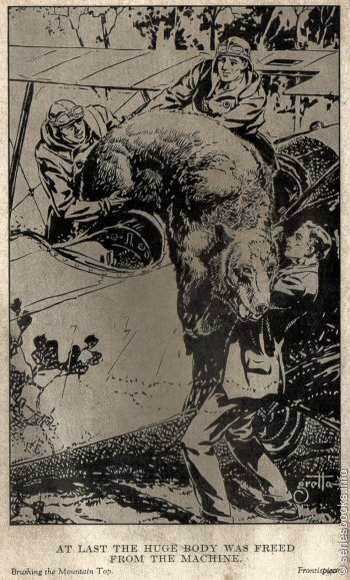 Ted is a likable hero; loyal, brave, intelligent and self-effacing to a fault and, despite the fact that Ted has amazingly bad luck in the air, his adventures aren't too improbable. 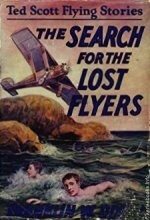 My Review Of "The Search for the Lost Flyers"
In this, the fifth and most improbable entry yet in the Ted Scott series, Ted's benefactor, Paul Monet, is planning a trip to the West Indies. 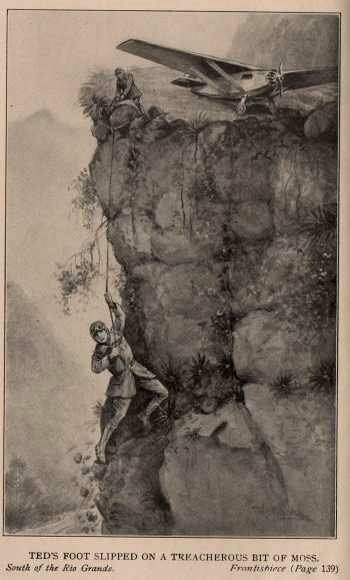 The twofold purpose of the journey is to bring Nina, the daughter of his late half-brother, back to the good old USA and to find the mysterious Island of the Cross of Palms. The island was discovered by Monet's half-brother while shipwrecked, and is the site of the fabulous Cave of Pearls. As is to be expected, the journey is not exactly going to be a walk in the park. 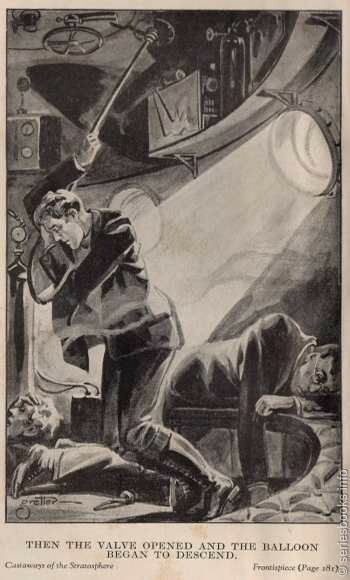 First, that old reliable Stratemeyer device, the giant man-eating octopus, apparently wearied of chasing Don Sturdy and his pals about, had taken up residence in the Cave and was not partial to visitors. Secondly, Monet's half-brother, in his haste to escape the beast, neglected to note the location of the island before sailing off on a crudely constructed raft. 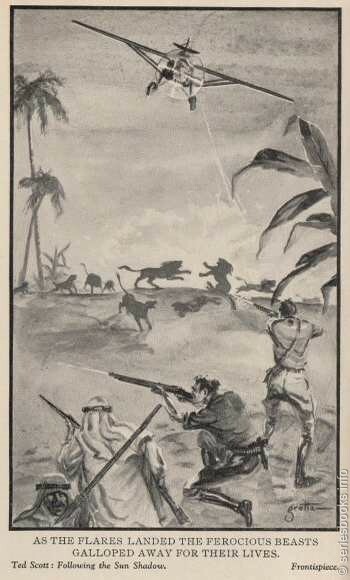 Picked up at sea several days later, crazed and about to expire, the best he could manage was a crude map showing the palm trees arranged in a cross and the legend "Look at it through the sun." 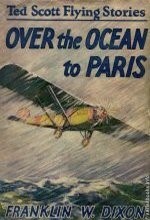 Monet and Ted's pal, Tom Ralston, fly to the West Indies in the Blue Gull and, of course, are promptly lost. 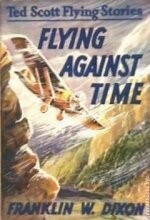 In the meantime, several chapter filling extraneous events occurs which do absolutely nothing to advance the plot. 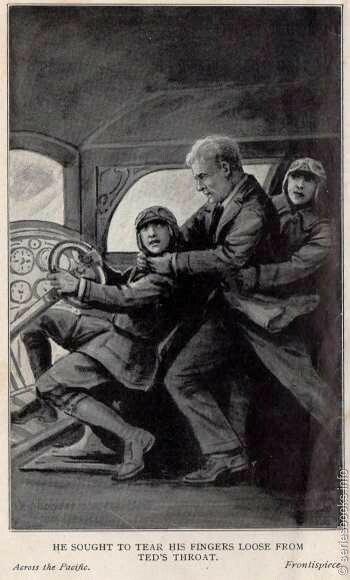 1: Eban and Charity Browning are assaulted and robbed by Greg and Duck Gale, who promptly depart Bromville after their customary thrashing by Ted. 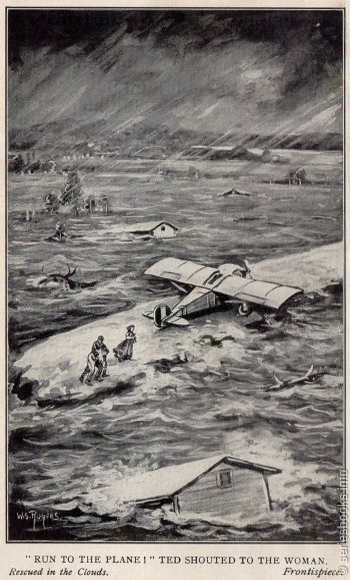 2: Ted rescues two small boys from being swept over a waterfall after the requisite storm set fire to his plane and forces him to land. 3: Monet's niece, Nina, arrives in Bromville, bad French accent and all, and takes up residence with Eban and Charity. 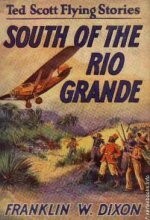 Finally, Ted and Walter Hapworth decide to fly down to the West Indies to locate their chums. 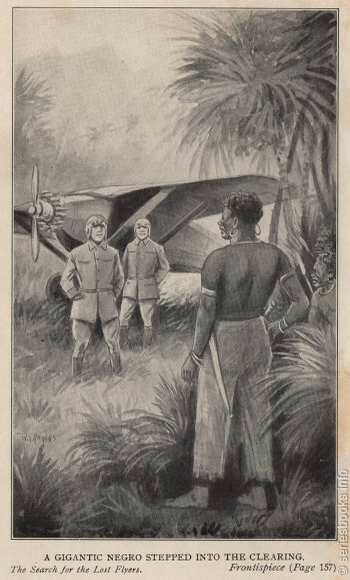 After several chapters of milling around, which includes being caught in a hurricane, and the attempted kidnapping/robbery of the pair by a gigantic Haitian gang leader, the stalwart duo find the elusive Island of the Cross of Palms and, of course, their lost pals. 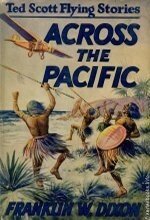 Ted and Hapworth swim into the Cave of Pearls, retrieve a fortune in pearls and then get chased by the tentacled giant and are forced to dig their way to freedom. Then they conveniently find Greg and Duck Gale and capture them. Everything now wrapped up, they all fly home. This is a very weak entry in this series. Chapter after chapter go by without any attempt to advance the plot. The requisite storms, rescues, and self-effacing gestures from Ted abound. Character are introduced and exit without having any bearing on the plot. Why? As Ted's closing remark in the book says: "Search me!"